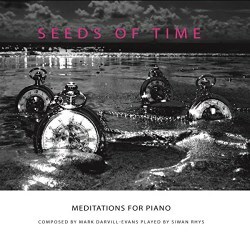 Mark Darvill-Evans, who studied at Cardiff University and has collaborated with composer Robert Szymanek admits to the influence on his music of Chopin, Satie, Debussy, Glass and Sakamoto. This is an interesting selection of composers and the ethos put me in mind of pianist Geoff Eales who, though from a different kind of tradition given his immersion in jazz, also shows a wide spectrum of influences. Both men also are inspired by landscape, crafting compact pieces, often with nature-inspired or topographical titles, for solo piano with sensitivity and thoughtfulness. Clouds offers a slow nimbus inspired by the Seven Sisters in Sussex – one can’t but help ‘see’ an Eric Slater woodcut as one listens – its gentle, Satie-like repetitions possibly alluding to the chalk ribbons that jut out to sea. Tristesse haunts Forgotten Kisses whilst Eternal cleverly sets up a contrast between the brightness of the right hand and the left, which generates a more up-tempo electric current. Endings enshrines some tinkling patterns that seem to evoke the twofold influence of Glass and folk music but Branches Overhead is a in memoriam, and its strong chordal passages – illuminating the composer’s ‘anger at helplessness’ – draw the music strongly onto another expressive level altogether. Serendipity explores more of Darvill-Evans’s compositional means; the sense of space, the deft allocation of pertinent silence and the cool, lateral exploration of mood. Then there is the sheer warmth of Sanctuary to enjoy, as well as the slow, limpid Moonlight on Roses, a piece in which time seems to remain suspended and the composer almost fears to stop. It’s no surprise to read in his notes that he wrote it for his wife. In a small, compact but sensitive way there is something almost Wordsworthian in Darvill-Evans’ recollections of time and nature and place, whether in the Chopin-influenced Twilight or the more textually diverse Rivers. His music recollects times and places and people with tranquility but also a most generous sense of texture, colour and harmonic nuance. In this quest, he is helped to no small degree by pianist Siwan Rhys who has clearly, on the composer’s own admission, informed the direction of some of the pieces.